Grandpa would look lovely in that, I think! Cute! I think I will make a onesie for our 2 month old! I made a similar design on a onesie for my (then) 2 month old for attending a wedding. I can tell you without a doubt he was the handsomest guy there - definitely a big hit with the older ladies in the crowd. I used black iron-on patch material to make a bow tie and then sewed on pearly silver buttons. Thanks for the design! I have had no luck with the inkjet iron-on transfers. Could you recommend the brand of paper that you are using? Thanks! Mine is HP, this one. wonderful! My 12 year old has been asking for a tuxedo shirt - I'm so excited to make this! What a cute idea! My sister is so excited for the Oscars, I'll have to show her this! My sister told me about your great thrift store finds. I'm completely jealous! Hope you all have a good time. You are such a great blogger; so entertaining! Hope you had a divine event Sunday. I've never tried the inkjet iron ons, but what a cute idea for an Oscar party! I can't wait to watch them. Clarification needed. If I sell my body (or my soul, for that matter) while I'm wearing the shirt, does that constitute commercial use? Is so, what sort of cut would you like? Clarification needed. Will you be wearing the shirt to attract, um, new business, and then removing it before performing services, or wearing it the entire time? Because that might make a difference in the royalties I require. HEY!! Isn't this supposed to be a family-friendly blog??? Of course! We're talking about Caroline's new shoe shine business. What are YOU talking about? Jess, can't you get Alex a real tuxedo? I'll be the first to admit that the Academy Awards these days are a pale imitation of what they once were, but come on, woman! A T-SHIRT??? haha this is cute! Thanks!! Soooo... let me get this straight. Caroline's gonna sell her body (or her soul, for that matter) for the privilege of shining shoes?! And she's going to wear one of these shirts, then take it off to polish the shoes with??? I think she'd better go back to selling fabrics and appreciate how good she had it!! That is so fabulous! I've got to add this to my Oscar Party Roundup. I love it! Love this! But I would be interested in seeing your "thrift store" find as well! Have fun at the party! I love it. What a great idea, thanks for sharing it. I always dreamed of marrying a man in a tuxedo t-shirt and jeans. This will be perfect when it finally happens! so cool!!! i cant wait to make one for me!!! thank you so much is such a nice design!! Can you print this on a black shirt? I'd like to change the colour to a white design on a black shirt. Is this possible? Thanks for the template it rocks! Where can I get this online? Thank you SOOOOOOOOO much! 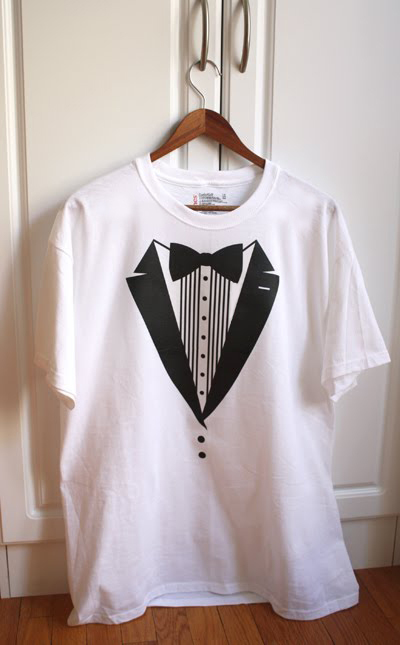 I couldn't find a tuxedo t-shirt in the stores, and I need one for tomorrow! This is PERFECT!! Thanks! Thank you so much for sharing this! I'm using it on a onesie for grandma's Oscar-themed birthday party and will be sure to blog about it next week! I guess a pink color of this tuxedo print on the shirt would be so cool! Thanks so much for this! I am using it this weekend to make tshirts for my boys to attend a movie-themed birthday party! How do I change the color of the pattern?? Just made this for a friend's baby shower! LOVE IT! would you be able to send the jpeg file of this to me? I would like to upload it to my silhouette machine to make a vinyl iron on - thank you! This is so cute! 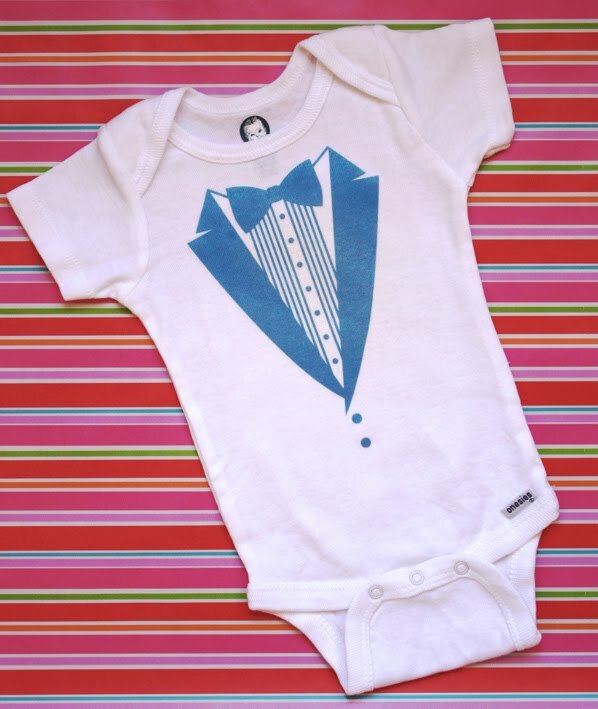 So when you want tuxedos for kids, then you can just download this adorable pattern and print it on a shirt or onesie. Because who really expects kids to be in tuxedos for any amount of time? How well does this transfer onto black shirts? Or this one only for transfer onto white shirts? The black design won't show up if transferred onto a black shirt. I did make a white-on-black version here, but it required some white iron-on material. Love this! I was looking for another design for a friends baby boy so thank you! When I post about it I'll link back to this post. I cannot thank you enough! My son is going to be the MC at his school talent show and completely forgetting to plan his attire, you SAVED me!!! Thank you!!!! Hi! The vector PDF can be opened in Adobe Illustrator and colors can be changed. Just keep in mind that if you fill all the shapes with white and print it, you will be printing a blank page. Used this for an upcoming bachelor party for a few of my mates and me. Thanks for the high quality PDF! Best on the net!